Tomato Jam ~ I put that “$@%!” on everything! 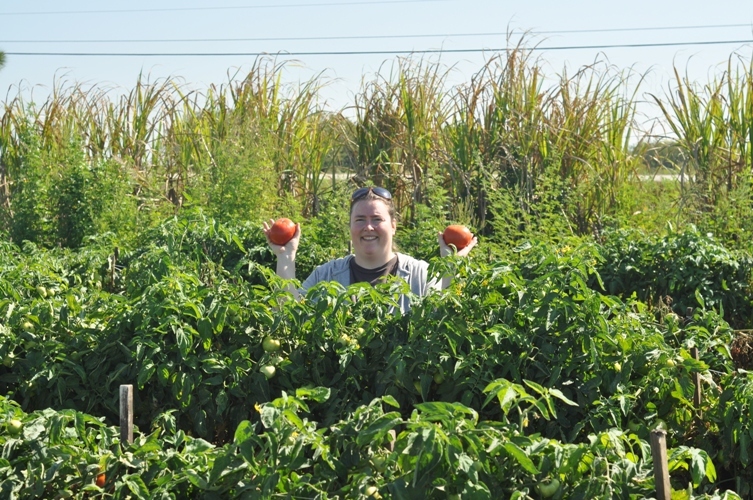 It’s tomato season here in South Florida and the fields are full of plump juicy red tomatoes. 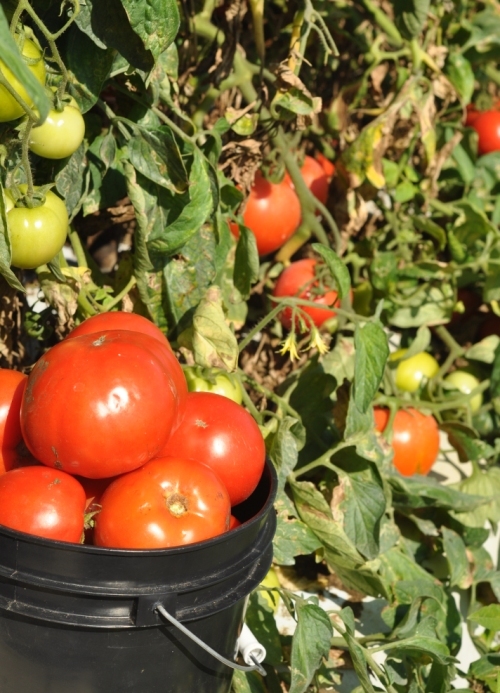 At Bedner’s, pick your own farm, you can forage for a heaping bucket of tomatoes in about 5-10 minutes. The vines are dripping with green and red tomatoes in a variety of sizes, with most of them being about as large as your fist. We spent more time taking photos and basking in the sunshine than picking the tomatoes. 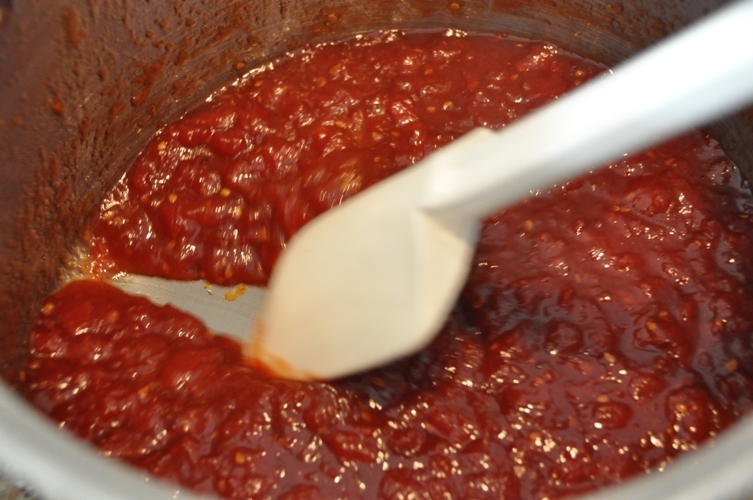 Last summer, we made 5 batches of this delicious tomato jam and we thought that would be more than enough! But, we put that “$@%! “on everything from toast and eggs to meatloaf and chicken. We open a new jar about every 2 weeks and we have our doubts about whether or not our supply will last until our Ontario tomatoes arrive sometime in late July. It’s now a staple in our home and replaced ketchup in most cases…and, that say’s a lot about how good it is because I’m a Heinz girl and love, love, love ketchup! So, we are deviating away from our citrus and strawberry plans to make a quick batch of this jam and honestly if I had my way I’d make more than one batch! You can find the recipe for this tomato jam here. It is really easy to make and we would strongly recommend giving it a try, especially for those of you who are just starting your canning careers. 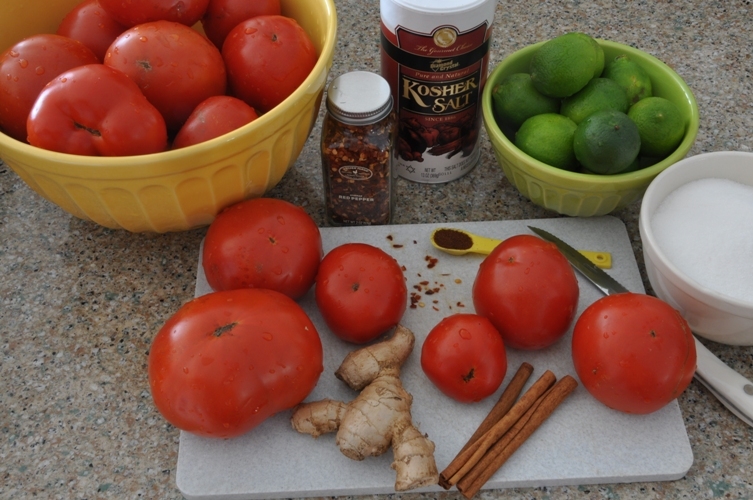 It takes about 1/2 hour to prep the ingredients and is made much easier if you select large tomatoes. The majority of your time will be spent cooking it down. 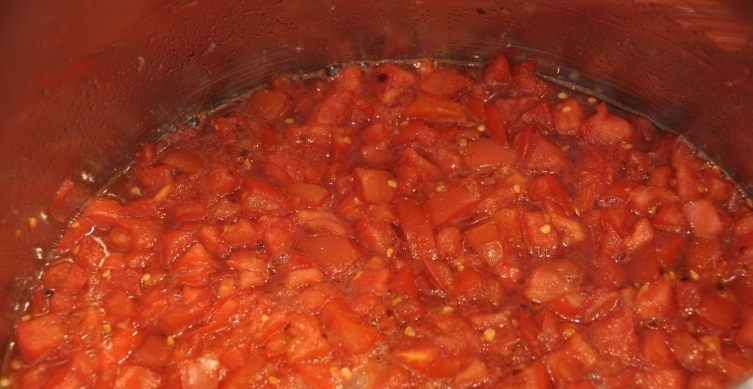 That takes about 1 to 1 1/2 hours because tomatoes are full of water but it doesn’t require too much attention at first. Just the occasional stir for the first 30 to 40 minutes will do the trick. 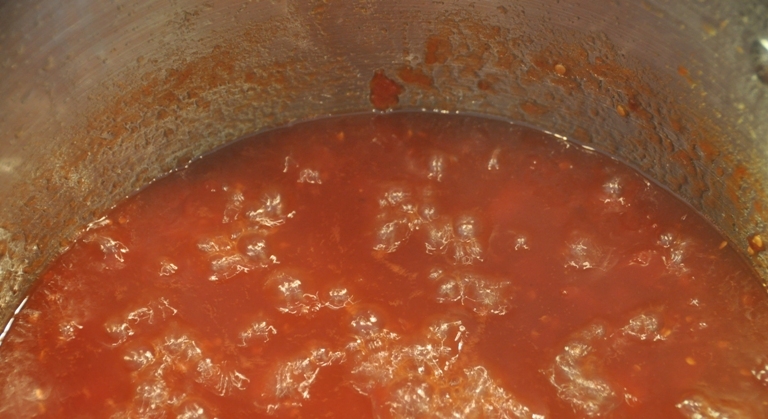 After about 40-60 minutes you will notice that the tomato jam has reduced by about half. Be sure to stir it more frequently so that it does not stick or burn to the bottom. Notice in the photo how much it has reduced. Notice the starting level on the side of the pot. It is ready to jar when you can draw your spoon or heat proof spatula across the bottom and see the pot. The jam is much thicker and now a rich red/burgundy colour. It appears glossy and the bubbles are smaller. At this point you should remove it from the heat and do your frozen spoon test. Collect a small representative of the jam on your spoon and hold it horizontally. If the jam collects into a large mass and does not run easily you know it is ready. If it continues to run quickly and forms syrupy drops return it to the heat and test again in a few minutes. 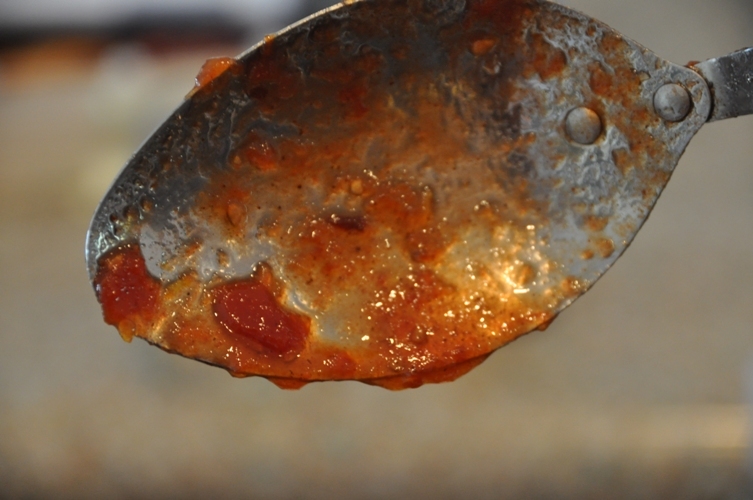 The photo below demonstrates a successful spoon test, this jam is ready to jar. Note: this jam always yields 5 x 250mL (half pint) jars, give or take a spoonful. This is another great way to know that it is ready to jar. If you have more than this amount chances are it is still too runny. And, for those interested, this jam has a pH of 3.66 (+or – .02). … sounds like things are getting pretty serious down there…. ps: it’s DUMPING snow here. This looks like sunshine in a jar! Will definitely make when my Opalka’s are ripe (just seeded the flats). Bring back some of that wonderful weather to the North!! I love that you are making tomato jam on your vacation. Too cute! You can use this jam as a condiment. It would probably be really awesome with chips, french fries, or anything else you like salsa or ketchup on. We seriously use it on so many things. It has such a great flavour ~ sweet with a bit of heat (from the chili flakes) but also a rich tomato taste. Mmmm, just thinking about it makes me need a spoonful. Let us know how you use it. I made this stuff last year and didn’t make nearly enough! I’ve used it in place of tomato paste, pizza sauce, tossed on pasta, as a glaze, to boost a vinaigrette, on crostini, swirled into soups, on and on. Won’t be canning pizza sauce or paste this year, those tomatoes are bound for conserva! Alright, you’ve convinced me. There’s something about tomato jam that sounds rancid and gnarly to me, but if you love it, there must be something to it. Looks like you’re having a blast.